Iranian media say that the country's crude exports have managed to hit a new record even as Washington withdrew from nuke deal and promised new sanctions. So I guess buyers are taking full advantage of the 180-day waiting period to stop buying from Iran. It's been a great sales gimmick. According to Tehran, they exported 2.4 MMbbl/d in May, and 300,000 bbl/d of NG condensate. It's not much more than April, though ... I think the total in April was 2.6 MMbbl/d (but that's both crude and condensates). That was May, this is now. 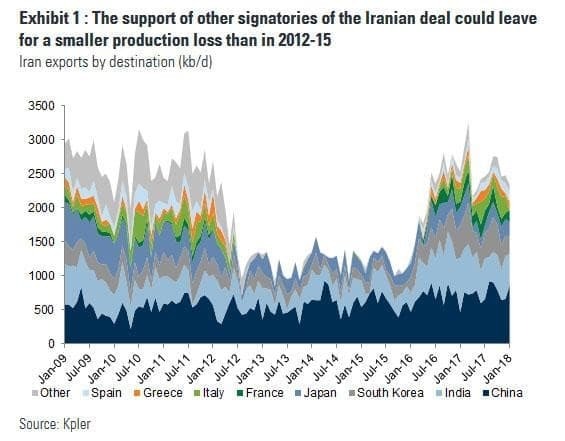 Agreed, but it's interesting to note that since sanctions have been lifted, a significant portion of their oil is once again going to Spain, Greece, Italy, and France.